So, a colleague’s birthday last week and in my wishes, I asked him to not waste his life doing laundry, and instead, get a life and a girlfriend. My other colleague from the previous discussion, ‘Mind Freeze’, laughed and insinuated that time for girlfriends is long gone for the older colleague, who is in 30+ club now. He declared that people after a certain age should not be thinking about girlfriends at all. He guffawed at the thought of a 30 or 40-year old girlfriend for any man. According to him, any woman over the age of 30 is no longer a ‘girl’, but a woman. The term ‘girlfriend’ seemed inappropriate to him. In fact, the thought of any relationship other than marriage seemed unsuitable for a person in 30s. I retorted that limited, closed-minded thinking makes the masses opinionated, sexist, intolerant, and patriarch. He is a young man of 26, who is not new to young metropolitan life. Does personal modish lifestyle guarantee a progressive thought process? I am not so sure now. Does this attitude smell of conceit? I am aghast at the impudence. This banter set me thinking. I had two pertinent questions troubling me. Is the term ‘girl’ age-restrictive, limiting the person in a woman? Is the age a defining factor in labelling things or actions ‘age appropriate’ or ‘inappropriate’? There are many more related questions like, was the term ‘girl’ friend taken too literally? Is the inappropriateness of having no regard for people, especially women, related to age? Is there a list of acceptable actions per age group? Who would dictate the terms for living one’s life as willed? Really! You will decide what age is suitable to be called a girlfriend or a boyfriend! What nerve? I am tempted here to talk about actions and reactions, mostly reactions, in a two-way communication. There are many theories on human personalities. Freudian Id, Ego, and the Superego; Florence Littauer’s Sanguine, Choleric, Melancholy, and Phlegmatic; and Eric Berne’s ego states. Transactional analysis (TA) by Eric Berne defines three ego states. These ego states are present in all individuals, and are diagrammatically depicted through three circles lined vertically, touching at the circumference. 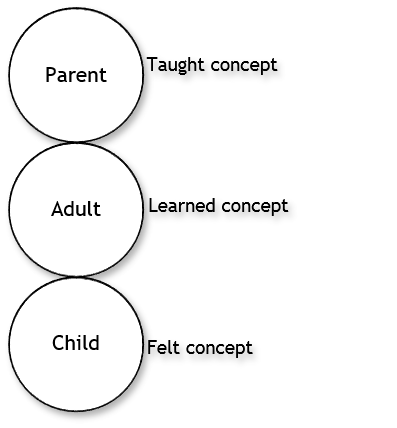 The topmost circle is parent ego state, with adult ego state in the middle circle, and the last circle is child ego state. The three terms are different in classification from the social definitions of age. Berne defined these terms as the ego states in an individual who receives a transactional stimulus, and responds. The person’s ego state, at the time of receiving the transaction, defines their response to the situation or the stimulus. If you look around, and within, you will find that more often than not, our actions are essentially reactions. Unfortunately, we mostly respond from either a parent ego state, (judgemental, patronising, coloured with pre-conceived notions and biases), or a child ego state, (emotional responses of fear, gaiety, blame, low self-esteem, or of self-preoccupation, and indifference). Only when we work from the adult ego state, are we able to evaluate, validate, assimilate, and then respond. Adult ego state functions from an informed platform. What is the purpose of introducing transactional analysis here? All contact in the living world is a transaction, with a stimulus and a response. Any action or a reaction is governed by various internal and external factors. In order to know what conduct is befitting a person or a group, a deep analysis of these factors is mandatory. TA is one form of analysing some of these factors. I am delving into these influencers, in order to find answers to my queries and to understand human nature a bit better. Hence, age appropriateness would be to use the adult ego state, drawing on the resources from both, parent and child ego states, analysing, validating, and then responding to a situation. In an individual, each ego state is responsible for keeping the other in check, forming a balance. An authoritarian parent, a rebellious child, or an unemotional adult can each be a problem individually. Yet, taught concepts of a parent state, feeling and compliance of a child state, coupled with the learned and reasoning state of an adult will help eliminate any or all of the following tendencies from manifesting – patriarchal, addictive rowdiness, and/or sociopathic. You can learn more about TA in the books ‘Games People Play’, ‘I’m Ok You’re Ok’, and ‘Staying Ok’. I am trying my best through the years to be less judgemental, breaking my biases and preconceived notions, trying to make informed decisions, without conforming to the shackles of society. This entry was posted in In my Opinion and tagged age, Cinderella quote, ego states, Eric Berne, Florence Littauer, freud, games people play, I'm ok you're ok, id ego superego, impudence, inappropriate, insuniation, patriarchal, preconceived notions, sociopathic, transactional analysis. Bookmark the permalink.